About 110 Piece Small Fuse Kit. What is a Fuse A safety device consisting of a strip of wire that melts & breaks an electric circuit if the current exceeds a safe level - Automotive fuses are a class of fuses used to protect the wiring & electrical equipment for vehicles. 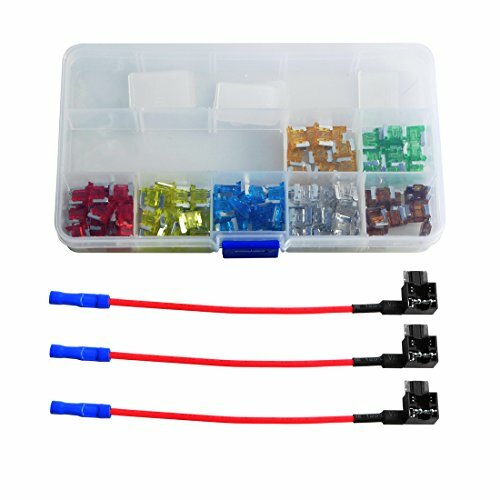 The Blade Fuses Pack provides everything you need to protect your vehicle & electrical devices from a short circuit or overload. 1.Contains the seven commonly used replacement fuses for most vehicles. 2.Clear Identification - Amp color coded & Amp numbers carved on the fuse for easy recognition. 3.Convenient Storage - Small molded case protects fuses, provides easy transport, & fits in your glove box or trunk in case of an emergency. - Case has re-locking snaps, so it can survive being in a glove compartment or trunk without spilling everywhere. 4.Price-Much cheaper than buying them at your local automotive store. 5.Nice to have lots of spare fuses if you have lots of equipment. 6.Perfect for any mechanic or repair shop. 7.Generally rated for circuits no higher than 24 volts direct current. Can be used for:Cars SUVs,Trucks,Motorcycles,Homes,Boats,Camper,RVs,ATVs,Quads,UTVs,Golf etc.